With Teamup Calendar, the administrator link is the “control center” of your calendar. The default administrator link is named “Administrator.” It is created with each new calendar. The calendar creator receives the administrator link on screen and by email at the time when the new Teamup Calendar is created. 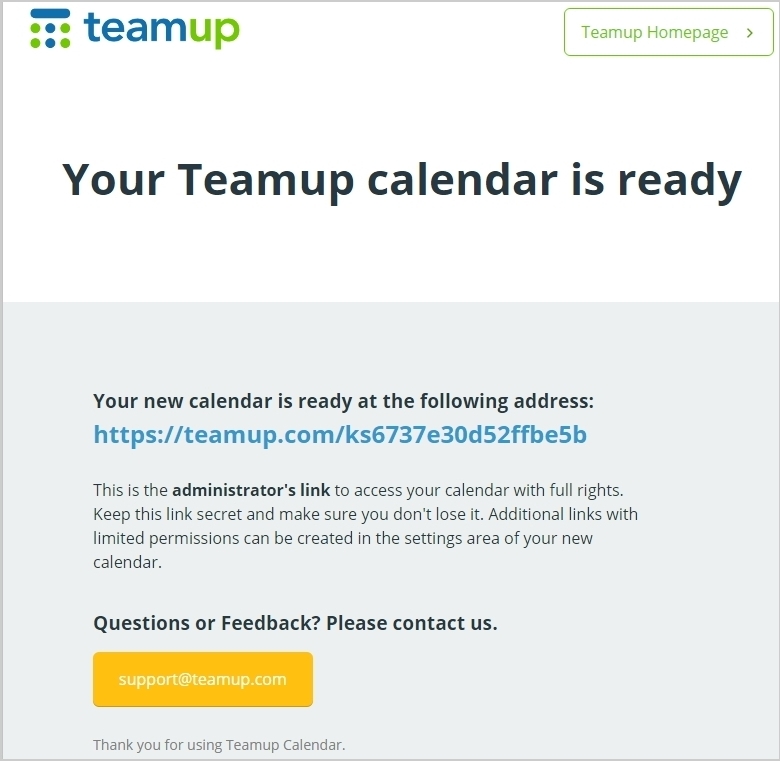 Design your Teamup Calendar to work best for your needs by adjusting the Settings and creating folders and sub-calendars. Control the access permissions for each calendar link, determining what users can do with the calendar. Delete or modify any sub-calendars. Change access levels for any user through link permissions or notifications. Export partial or entire calendar data to external files. Be sure to use these abilities carefully and guard them properly to maximize the positive impact of Teamup on your group. Carefully consider the DOs and DON’Ts of an administrator link, as discussed below. What is a Teamup calendar administrator link? The administrator link is also sent to you via email, when a Teamup Calendar is first created. The default administrator link can be renamed, or new links with administrator rights created. Note that administrator rights should only be granted to additional calendar links if really necessary. Create new calendar links, including those with administrator privileges, in Settings > Sharing. To determine if a link has administrator rights, click the blue menu icon on the right of the calendar. If you see Settings on the top of the drop-down list, the link has administrator access. Only administrator links can access the calendar Settings. If Settings does not appear as an option on the drop-down list, the link does not have administrator privileges. Take note that there is no log on needed to access a Teamup Calendar. All that you need to open your calendar is your calendar link. There are Teamup user accounts, but these are optional and not required for calendar access. The calendar Settings can only be accessed when viewing your calendar with the administrator link. Create calendar links for sharing. Modify access permissions for calendar links. Set up passwords for calendar links. See how to manage calendar links for more information. Set up (create, modify, enable/disable, or delete) sub-calendars. Switch on notifications and iCalendar feeds. Enable or disable calendar views. Customize the calendar header, time and date settings, and other general settings. When viewing your calendar with the administrator link, all sub-calendars and their events are visible, and all actions on events are permitted. See the Getting Started Guide for calendar administrators for more information. An administrator link gives you access to the ‘control center’ of your calendar. It is therefore important to only use the calendar administrator link when necessary. Do not share your calendar administrator link with others unless they have permission to access the calendar Settings. Keeping your administrator link protected, and using it only when necessary, allows you to keep control of your calendar data, maintain calendar security, and avoid accidental changes or problems in the calendar Settings. We recommend limiting the administrator access to yourself and any additional users who really need to have access to the ‘control center’ of the calendar. In most cases, you only need one administrator link per calendar. 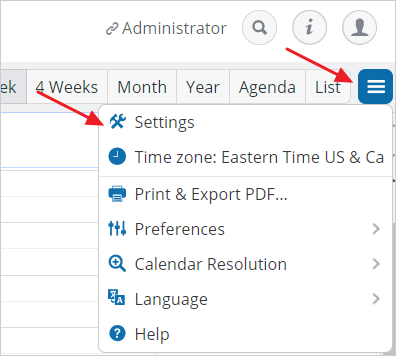 If a calendar users needs to have full capability to manage events, including adding new events, updating, or deleting existing events, create and share a link with the Modifier permission with that user. You can share the pre-configured Modifier link in Settings > Sharing. Or create your own customized links for others to use for calendar access. Learn more about access permissions and sharing calendar links. Be careful not to use the administrator link when publishing your calendar on Facebook or embedding your calendar into your web site. It would be a serious risk to your calendar content should you allow the public to access the Settings and all sub-calendars with all events. Do not use the administrator link to set up notifications for others. The notification email contains a link back to the calendar with the access level it was subscribed from. If you subscribe another person’s email address to notifications when viewing the calendar from the administrator link, that person will receive emails with an administrator link back to the calendar. In other words, you would give the non-administrator users access to the administrator link, which is not desirable behavior. If you do need to subscribe to notifications for non-administrator users, make sure you view the calendar using their calendar link (or a link with appropriate permissions). Then subscribe their email address to receive notifications. Ideally, each individual calendar user should set up their own notifications from their own calendar link. This ensures that the correct permissions are allowed in the notification emails. Do not use the administrator link to get the iCalendar feed .ics link for others as the .ics feeds contain the calendar link used to create them. Each .ics feed contains the calendar link it was created from, with the same access permission as that calendar link. Individual calendar users should view the calendar using their own calendar link, then go to the iCalendar feed list and copy the appropriate .ics link. What happens if you lose your administrator link? If you lose your administrator link, use our Calendar Link Recovery Tool to retrieve it. If you did not enter your email address upon creation of your calendar (before an email address became a mandatory field), it is a good idea to add one now. Having a designated administrator email makes it easier to retrieve a lost administrator link. Enter your email in Settings > General Settings > Administrator’s email field. We will not use your email address for any other purpose than necessary communication. We only send occasional newsletters and will never spam you. If you suspect your calendar administrator link has gotten into the wrong hands, you can create another administrator link and delete the original. Do this in Settings > Sharing from the new admin link. Learn how to do this successfully in this article on managing calendar links.